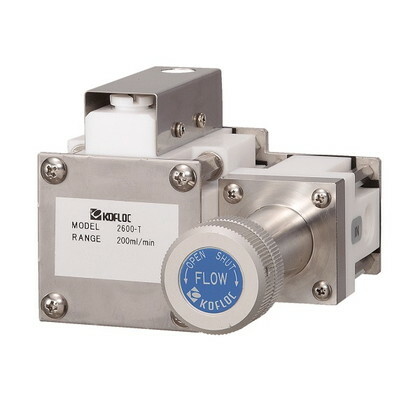 A valve composed of high-precision components ensures smooth control of flows. Flows are maintained at a constant rate against fluctuations of both primary and secondary pressures. This resin (PTFE) is perfect for a part apt to be easily damaged by metal ions. Minute flows are also controllable optionally. • Model 2600, all-Teflon type, is compatible with practically all chemicals thanks to the use of a Perfluoro O-ring. Air bubble purge at the initial flow setting stage of operation provides the most accurate possible control. Custom-ordered flow ranges as well as types for special fluids are optionally available. Please contact us for information. * The specifications above are subject to change without prior notice. Install a filter or the like on the IN side to prevent entry of foreign substances.